For more than a decade, Grammy- and Emmy-nominated artist and composer, Máiréad Nesbitt has enchanted millions of fans around the world as the Celtic violinist and founding member of the globetrotting music phenomenon Celtic Woman. Loyal fans of all ages, across geographical and cultural boundaries far beyond the musical heritage of Ireland, have adored her beguiling stage presence and versatile instrumental talents. As the featured violin soloist on all 11 Celtic Woman albums, each title achieved the coveted #1 slot on the Billboard World Music Chart. A former all-Ireland fiddle champion and past member of the National Youth Orchestra of Ireland, Máiréad completed her studies at CIT, Cork School of Music under Cornelia Zanidache and at the London Royal Academy, with post-graduate studies under Emanuel Hurwitz on violin and piano. As musical influences, Máiréad cites her family, along with a wide range of musicians that includes classical violinist Itzhak Perlman, jazz great Stephane Grappelli, bluegrass icon Alison Krauss, Irish fiddlers Liz Carroll, Michael Coleman and Andy McGann, and rock performers like David Bowie, Sting and Bjork. An Irish Music Magazine Best Traditional Artist and multi Irish Music Awards recipient, Máiréad has emerged as one of Ireland’s most in-demand musicians, as well as a prominent presence on the Celtic and World Music scene. 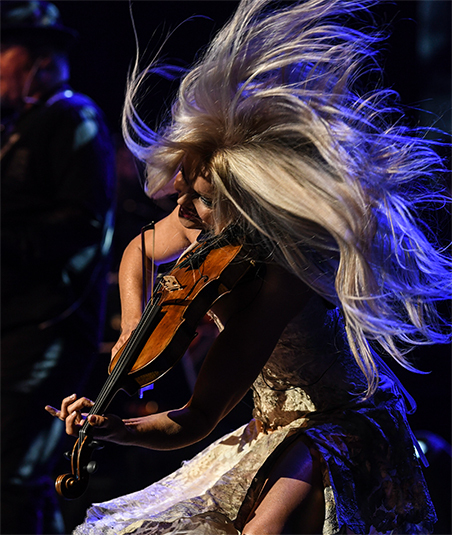 ‘A demon of a fiddle player’ –New York Times. Máiréad solo albums Raining Up and new album Hibernia charted on 4 separate Billboard Album Charts. World Music Charts; Classical Crossover Charts, Classical Charts and Heatseeker Charts. The long awaited Nesbitt family album Devil’s Bit Sessions has charted on the Billboard World Music Charts. The unique ‘session’ style live album was recorded in the Nesbitt Family home in County Tipperary, at the foot of the The Devil’s Bit Mountain. It features 19 tracks and chats performed by three generations of the Nesbitt Family. Máiréad has launched her own violin line, The Máiréad Nesbitt Celtic Violin Collection and is available now from her website www.maireadnesbittviolin.com as well as select stores in the USA and Ireland. 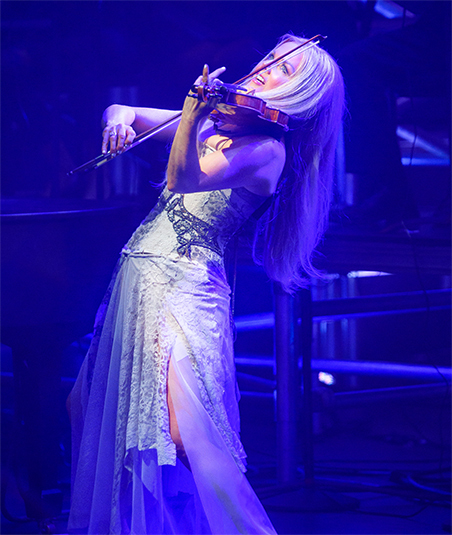 Máiréad featured her Máiréad Elite Viennese custom violin on the sensational new show Rocktopia where she is currently guest solo violinist spanning the genres of Rock, Classical and Celtic. Máiréad’s expansive musical portfolio spans the worlds of Celtic, Classical and Contemporary popular music. In addition to 11 albums and numerous tours with Celtic Woman, she guests, records and composes for groups such as The Dhol Foundation and The Afro Celt Sound System. Máiréad began her professional career at 16 with the prestigious RTÉ Concert Orchestra, and her playing was featured on the original soundtracks of the shows Riverdance, Lord of the Dance and Feet of Flames, touring the world as lead fiddler with the latter two shows. She composed the original music score for the show Irish Dance Invasion, is featured on the Celtic Tenors’ Live In Concert DVD, and is featured violin soloist on the soundtracks of the two Disney films, Tinker Bell, and Tinker Bell and the Lost Treasure. Máiréad’s distinctive blend of traditional Irish and classical styles features in work with international artists such as as Nigel Kennedy, Van Morrison, Sinéad O’Connor, Clannad, Emmylou Harris, Aslan, Chris De Burgh and Jimmy Webb, as well as Irish music icons like Sharon Shannon, Paul Brady, Frances Black, Cooney and Begley, Jimmy McCarthy and Dónal Lunny’s Coolfin, music is truly a life’s work. She grew up in a musical family in Loughmore, County Tipperary. Her parents John & Kathleen Nesbitt are music educators & lecturers, and all five of her siblings are award winning musicians. Máiréad’s eclectic career has always encompassed the contrasting styles of classical and Irish traditional music. Máiréad has played at the White House and the Pentagon for four US presidents. Among the famous venues and symphony concert halls she has performed in worldwide, highlights include Carnegie Hall, Radio City Music Hall, Red Rocks Colorado and Hyde Park. Máiréad was guest soloist at Carnegie Hall Dec. 1st, 2017 with renowned artists Sibylle Szaggers Redford and the Tim Janis Ensemble for The Way of The Rain. Máiréad had the privilege of returning as guest soloist to Carnegie Hall Nov. 30th, 2018 for Christmas with Tim Janis and Special Guests. Máiréad made her Broadway debut at The Broadway featuring in the spectacular show Rocktopia in 2018 from March 20th for six weeks. “I have to tip my hat-or rather my metaphorical bow- to Máiréad Nesbitt. Nesbitt’s album Hibernia proved itself a great accomplishment in both Classical and Celtic genres. It used the image of Hibernia to promote a musical legacy with integrity and energized re-vision.” –The Irish Echo. “There’s a bit of the ‘divil’ in the music too, as the tunes ranges from the core reels and jigs to sprightly strathsbeys and sentimental slow airs. Devil’s Bit Sessions is a rivetingly engaging listen. More power to the Nesbitt’s.” –Irish Music Magazine. “Raining Up is a contemporary Celtic masterpiece.” –The Birmingham Post. “Raining Up is an album of considerable beauty, and shows Nesbitt with one foot in the traditional camp and another in a chill-out ambient groove.” –The Irish Post.